If you have a co-occurring disorder (a substance use disorder and a mental health disorder) this article will help you understand what types of integrated treatment you need. OK – the experts recommend integrated treatment for co-occurring disorders, but what does this look like in reality? Where are you supposed to get treated and how are you supposed to pick and choose among all your options... how is this supposed to work?!? In severe cases, is it a psychiatric hospital you need or a residential addiction treatment program which specializes in care for those with co-occurring disorders? In milder cases, do you need outpatient addiction treatment with supplementary medication or general counseling combined with AA/NA or SMART Recovery in the evenings? Getting appropriately matched integrated treatment greatly improves your odds of success, but how are you supposed to know what you need when faced with such an overwhelming array of options? Well, for starters, this isn’t a decision you should make alone. You probably don’t know about all local programs and treatment options and you probably shouldn't build your recovery on the unstable grounds of self diagnosis. Find a professional you trust and get help designing a treatment program that makes sense – and if you can, get a loved-one involved in the discussion too. But though you shouldn’t make this decision without help, getting educated always makes sense. At minimum it allows for an informed conversation with your healthcare team and at best it saves you from wasting your time on a treatment plan that won't work. A system called the 4 Quadrant Model that provides a basic framework for matching disorder severity with appropriate treatment. Treatment options for each of the 4 quadrants (for whichever of the 4 squares you fit into). Assessment instruments you can use to assess the severity of your mental disorder and your substance use disorder. An introduction to addiction treatment programs designed for co-occurring disorder clients. Professionals use the 4 quadrant model as a diagnostic tool to help determine correct treatment recommendations. As the name would indicate, the tool is based on a 4 box model, and every person with a co-occurring disorder will fall into one of the 4 quadrants. Once you identify your quadrant you can narrow your focus onto treatment options that make the most sense for you. Within the primary healthcare system (such as by your physician). From either intermediate outpatient addiction treatment or intermediate outpatient mental health programs (for example, intensive outpatient programs). In some cases, people in this quadrant might benefit from some integration of services between mental health and addiction treatment providers. People with serious mental illness and milder substance use disorders are best served within the metal health system. You can access the mental health system through outpatient mental health centers (such as clinics) or more intensive residential or inpatient programs. Many mental health providers will also offer some addiction treatment, such as motivational interviewing or skills training. To find mental health services in your area, visit SAMHSA’s Behavioral Health Locator Tool. People with more serious substance use disorders and less serious mental health disorders should receive substance abuse treatment as the primary focus of care. The types of treatment facilities capable of providing care for people in this quadrant are often referred to as dual diagnosis capable (DDC) or dual diagnosis enhanced (DDE). See below for more information on these types of specialty programs. Specialized long-term residential substance treatment programs, such as modified therapeutic communities (sometimes within the criminal justice system). So what to do when facing substance use and mental disorders of unknown severities? But for your own education, here are a couple of assessment instruments that may provide you with a better understanding of the seriousness of your 2 conditions. Once you’ve diagnosed the severity of each independent condition you’ll know which quadrant you fall into – and thus what type of care you likely need. This scale is intended for adults over the age of 18. It provides you with a score from 0 to 100 that corresponds with the severity of your mental health disorder – the lower the score, the greater the disorder severity. 100 - 91 - You have excellent functioning across a range of everyday activities and no symptoms of any mental disorder. Other people interact with you by choice because of your positive personality. You never allow common problems to grow out of hand. 90 - 81 – You have no or very few symptoms of any mental disorder and a good level of functioning across a range of everyday activities. You have normal everyday problems but are generally satisfied with life and socially effective. 80 - 71 – You have some symptoms of mental disorder, but these symptoms are impermanent and they occur as a normal response to an environmental or behavioral stressor. Your symptoms cause you very little impairment in your general functioning at work/school and in relationships. An example could be feeling low for a few days after failing an important exam. 70 - 61 – You have lasting mild symptoms of a mental disorder but you still function well at school/work and you’re able to maintain relationships. 50 - 41 – You have serious symptoms of a mental disorder (for example, major depression, suicidal ideation, etc.) or you have serious problems with everyday social functioning (can’t get or keep a job, no social contacts). 30 - 21 – You have a serious loss of contact with reality which influences your behaviors, or you have serious inability to maintain normal communication or behaviors (very inappropriate acts, for example) or you have a complete inability to function in basically all areas. 20 - 11 – You are in moderate danger of hurting yourself or others or you sometimes don’t maintain even minimal standards of personal hygiene (use of toilet, for example) or you can no longer communicate at all. 10 - 1 – You are in serious and lasting danger of hurting yourself or others. You never maintain minimum standards of personal hygiene or you make serious suicide attempts. Note – this scale is intended to serve as one diagnostic tool to be used in conjunction with other contextual behavioral and environmental information - and in combination with subjective common sense. People with low to moderate substance use disorders (abuse - not addiction, little compulsion, etc.) 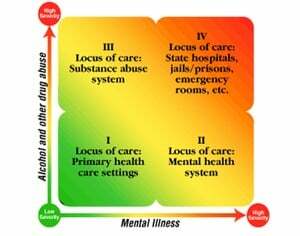 would qualify for less intense substance disorder treatment as in quadrants 1 and 2. People with substance use disorders defined by addiction, compulsive use and loss of control would qualify for more intense addiction treatment, as in quadrants 3 and 4. Take this quick self-test to gauge the severity of your dependence. A person needing medical management of withdrawal or intoxication requires more intensive substance abuse treatment than a person already detoxed and clean/sober. You require more intensive treatment if you have acute or chronic physical health conditions that complicate participation. For example, someone weakened after a pancreatitis attack or with poor liver function might require more intensive treatment (residential) than someone in good physical shape (able to travel to outpatient meetings). A person very motivated to change may do well in a less intensive treatment environment, while a person with greater ambivalence about change may require greater structure and intensity to achieve the same outcome. If you can’t maintain even short periods of abstinence and acute intoxication interferes with your ability to participate in outpatient treatment, then you likely require residential treatment. People lacking a safe and sober living environment typically require more intense treatment than people in supportive environments. DDC Programs – These programs are set up to address the interaction between mental disorders and substance use disorders, even when focused primarily on addiction treatment. DDC programs offer treatment content that is adapted to the unique motivation, relapse prevention, recovery planning and treatment integration needs of clients with co-occurring disorders. DDE Programs – Compared to DDC programs, DDE programs offer a higher level of treatment integration and can accept people for primary addiction treatment who have more serious mental health disorder symptoms or functional impairment. To find DDC and DDE programs, you can use SAMHSA's Substance Abuse Treatment Locator Tool, which allows you to search for programs in a radius around your home. When using the tool, navigate to the advanced search and narrow the field by selecting programs that offer ‘a mix of substance abuse and mental health treatment services'. Use the quadrant framework with a healthy-dose of common sense – especially when considering how fluid and changeable symptoms can be, even even short periods of time. 4 What Treatment Is Best for Co-Occurring Disorders?